No one really likes to think much about their sewers, let alone the need for sewer repair services. Sewer pipes are the kind of things that you never notice, as long as everything’s working correctly. Most New Jersey homeowners go for years without ever having a serious sewer repair emergency, but it can actually happen unexpectedly. For many homeowners, a cracked, clogged, or broken sewer pipe comes as a surprise. These problems build up gradually for months or years, with NJ homeowners usually having no idea about things like organic matter clogs or tree root incursion until they experience a sewer backup. Clogged fixtures, sewer smells, and a waterlogged lawn reveal that something is very, very wrong down in the sewer line. At this point, you’ll definitely need to call a professional to get the problem taken care of. At A1 Sewer & Drain, we provide 24-hour, same-day emergency sewer repair service in NJ. Our sewer and drain contractors are available in New Jersey at any time to help you with your sewer problems, and the sooner you get professional help, the sooner your sewer problems will be resolved. If you’re suddenly faced with a broken or severely clogged sewer line, call us anytime at A1 Sewer Repair, at 201-645-0888. Sewer line problems are not always self evident. How do you know when you need to call a professional? For many homeowners, the line can be rather blurry. Sewer problems can hit you out of nowhere, but they actually don’t suddenly pop up overnight. The problem has usually been building up for a long time, but since it’s hidden away underground in the sewers, you probably had no idea about it. A cracked pipe or a clog from organic material can go unnoticed, until eventually, it becomes severe enough that your home plumbing is severely affected. These are some of the most common signs that you need sewer repair, fast. If you notice these problems around your home, you should call a professional as soon as possible, before things can get any worse. Multiple clogged drain fixtures. This is one of the most common signs that something’s wrong with your sewer line, and that you’ll probably need sewer repairs. It’s a familiar story: suddenly, one day, none of the plumbing fixtures are flushing or draining properly. Sure, drains can occasionally clog. We’ve all dealt with a backed-up toilet or a clogged garbage disposal from bacon grease or food scraps. But think about it: what are the odds that every single drain and toilet will clog up for normal reasons, at the same time? When this happens, the issue isn’t clogged drains. 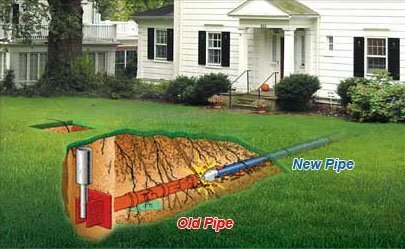 The problem lurks deep within the sewer line, underground beneath your property. No plunger in the world can solve this problem for you: you’ll need professionals with the tools to get down into the sewers. When you use one fixture, another drain gurgles or oozes water. Does your sink or shower drain start to gurgle and bubble up with water every time you flush the toilet? This is a textbook sign that you have a clogged sewer line, or a broken section of sewer pipe. In many cases, the water that comes up from the drain is dirty “grey water” that’s already been used. A faint but pervasive smell of sewage. When your sewer is backed up, you’ll often notice the telltale smell of old sewage. It might emanate from your drains and fixtures, although in many cases, it’s quite noticeable in your basement areas. Smelling sewage isn’t normal– or pleasant. Call a professional NJ plumber for sewer repairs. Sewage backup up into your toilets and drains. Serious sewer backup doesn’t always occur from a clogged or broken sewer line, but when it does, it’s one of the nastiest problems our sewer service contractors encounter. It’s a nightmare for homeowners: waste and sludge coming back up through the pipes, and oozing out your drains and toilets. It can happen, and it’s a serious mess. You probably don’t need to be told that this is the time to call a professional sewer repair company. It’s not only disgusting, but frankly, it’s a serious health hazard, which is why fast repairs are so important for a serious sewer backup. There are a few sewer line problems that contractors regularly encounter in New Jersey homes and businesses. Although some of these issues are preventable, others are basically out of your control. They often cause similar signs that homeowners notice, as we talked about in the previous section. This can make it hard to figure out what’s wrong, but as NJ sewer repair contractors, we have technology on our side. We actually use sewer camera inspection systems to identify most sewer problems, so we know what we need to do to fix it. Our sewer cameras, available from companies like CUES, Aries Industries, and Envirosight, let us remotely get a good look right inside the sewer line. Mounted on flexible, extendable rods that we can lower into the sewers, these cameras use fiber optics to relay a video feed onto a laptop or monitor. This is the best, easiest way to diagnose your sewer problems, without having to dig down and access the sewer pipe directly. We can see exactly what’s going on down there, and plan sewer repairs or sewer cleaning accordingly. Tree root incursion. Many homeowners don’t expect this one. Believe it or not, tree roots are one of the leading causes of clogged and broken sewer pipes that need professional sewer repairs. New Jersey is a naturally forested environment, and many homeowners have large trees like pines, oaks, and birches growing on their property. What many people don’t realize, is just how far their root systems can spread. These trees have sprawling, extensive root networks, and are often sending out new root shoots in search of nutrients and moisture. Unfortunately, the area around your sewer pipes has exactly what the trees are “looking” for: moisture and vital nutrients. Tree roots will often begin to grow around, on, and into the pipes themselves, leading to cracks, clogs, and fractures. Because this is all happening underground, homeowners have no idea until sewer problems become noticeable. Fortunately, techniques like hydro jetting and trenchless sewer repair techniques can remove the roots and fix the damage that they’ve caused. Clogs from flushed materials. Many homeowners flush paper products that aren’t designed to break down in the sewer system. This can clog your sewer line over time. Normal toilet paper is specifically designed to break down quickly when exposed to water; for other paper products, the opposite is true. Absorbent paper materials like paper towels, feminine products, facial tissues, and diapers are designed to retain their integrity when wet, rather than dissolving. Because of this, they can clog up your sewer line. Clogs from grease and other organics. Grease is notorious for causing plumbing clogs, and your sewer is no exception. Always avoid washing vegetable oils, bacon grease, and other viscous lipids down your sink or garbage disposal. Instead of breaking down, grease just sticks to the pipes and builds up over time, potentially clogging or damaging your sewer line. Broken, cracked, or misaligned pipes. This problem can occur for several different reasons. In many cases, this kind of pipe damage results from shifting soil. During the winters in New Jersey, the ground will often freeze. When it thaws back up, pipes can shift into the wrong position, obstructing water flow. Bellied pipes. A “bellied pipe” is a sewer pipe that’s bucked and sunk downward, often from shifting soil or disruption by tree roots. This creates a low point where waste builds up, instead of flowing away from your home. Bellied pipes require sewer pipe repair or sewer line replacement. Pipe Corrosion. This isn’t an issue with newer PVC pipes, but it’s often found in aging metal pipes on older properties. Like any metal object that’s in constant contact with running water, the sewer pipes can rust and corrode over time, leading to leaks and holes. Sewer pipe collapse. A collapsed sewer line occurs when the pipe completely loses its remaining structural integrity, usually after gradually weakening over months or years. This causes typical sewer line problems with your plumbing, as well as releasing wastewater into your yard and soil. A soggy lawn is often a sign that the pipe has collapsed, and you need emergency sewer repair as soon as possible. 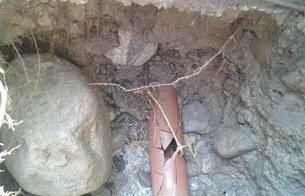 These are some of the most common issues that our sewer line repair contractors find on New Jersey properties. Fortunately, all of these problems can be fixed with sewer repair or sewer pipe replacement service, restoring normal water flow and preventing any further problems. At A1 Sewer & Drain, our contractors almost always use trenchless sewer repair techniques to fix problems with New Jersey sewer lines. In the past, sewer repairs were often an invasive, intensive process. Contractors had to dig large trenches, often ruining driveways or landscaping, in order to access the sewer pipes directly. Fortunately, trenches are largely a thing of the past. 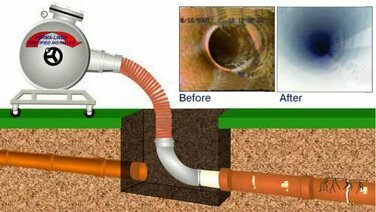 Trenchless sewer line repair allows us to fix most sewer pipe problems, without having to dig any holes. These techniques are less invasive, and much easier for homeowners and businesses to deal with. Pipe lining. Pipe lining is a simple, noninvasive method of repairing cracked or broken sections of pipe. 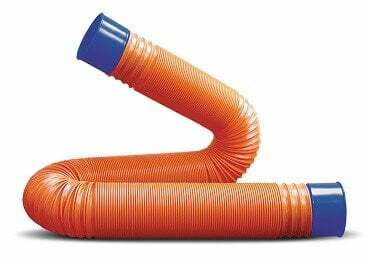 The pipe liner creates a new “pipe within a pipe” to patch up any cracks or holes. When we insert the liner, it’s soft and flexible. However, the special resin-coated plastic it’s made out of will harden after being placed into the sewer, creating a new section of sewer pipe without any digging. Pipe bursting. This method is used for more severely broken sewer pipes, as well as for jointed sections of pipe. As the new section of pipe is inserted, it pushes the broken part outward, further fracturing it and breaking it apart. This allows us to insert a new section of sewer line, while safely removing the old one by pushing the pieces away. Nearly all modern sewer repair jobs can be fixed with trenchless repair techniques. Although digging is still needed in a few cases, the majority of our work uses trenchless methods instead. If you notice the signs of a clogged or broken sewer line on your property, there’s not much you can do by yourself. Unlike a typical clogged drain, sewer line repairs aren’t something you can fix yourself with a little bit of DIY plumbing skill. It’s a messy, complicated job that requires professional training, tools, and techniques. Although sewer problems are insidious, slowly building up over time without your knowledge, it’s incredibly important to call a professional sewer repair company when you notice the signs of a problem. The longer you wait, the worse– and messier– the problem is going to get. 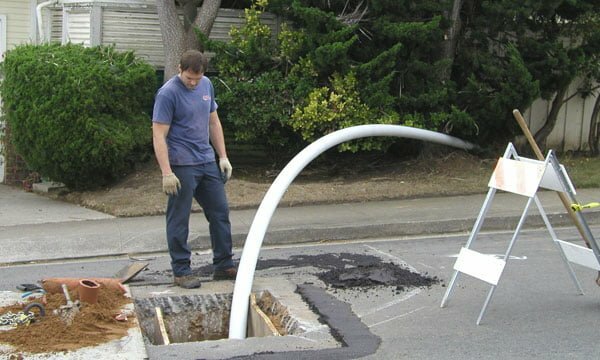 When you suddenly find yourself in need of sewer line repairs in New Jersey, our contractors at A1 Sewer & Drain are available 24/7 for emergency sewer repair calls. No matter what day or time it is, you can call us, and we’ll send out a contractor to your doorstep for same-day service. 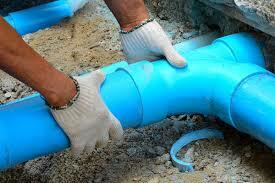 Our experienced sewer repair contractors have years of experience dealing with sewer problems. When we arrive, we’ll make a diagnosis, and then inform you about your options for effective sewer pipe repair that will resolve the problem for good. Never wait around for sewer repairs: call as soon as you notice the problem, and the repair job will go more smoothly for everyone. For fast, reliable sewer repair service in New Jersey, call us today at A1 Sewer & Drain, at 201-645-0888.